Sometimes it feels like life’s falling apart at the seams. Sometimes you’re completely worn out by stresses that never seem to end. 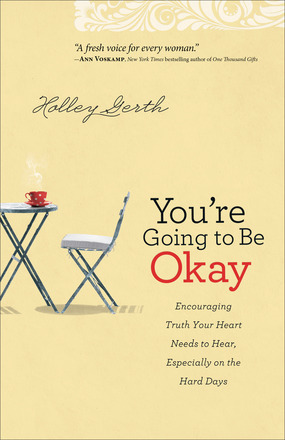 For every woman who has been disappointed, who has watched a dream die, whose life isn’t what she imagined it would be, bestselling author Holley Gerth has a heartfelt message of hope–you really “are” going to be okay. And it “is” possible to live with joy, resilience, and strength in both the good times and the bad. In fact, she says, that’s what God desires for us. With her trademark positive encouragement and probing questions for self-reflection, Holley encourages women to spend less of their lives regretting and more of their lives truly living. She shows them how to guard their hearts against despair and look to the future with confidence, remembering that they are part of a greater plan and “nothing “can stop God’s purposes for them. Holley Gerth is a bestselling writer, certified life coach, and speaker. She loves connecting with the hearts of women through her popular blog and books like You’re Already Amazing, You’re Made for a God-Sized Dream, and Opening the Door to Your God-Sized Dream. She’s also cofounder of (in)courage and a partner with DaySpring. Holley lives with her husband, Mark, in the South. Hang out with her at www.holleygerth.com. A little over a year ago, my grandpa had a ninetieth birthday party. I had the privilege of being there and serving punch. That put me in a position to do a lot of listening. Over fifty people packed into his house, and each one came with a story. On and on the stories went of how my grandpa has spent his life loving well, in little and big ways. I nodded my head in agreement because I’ve experienced the same. For over fifteen years now, my grandpa has taken me out on breakfast dates to ask me how I’m doing and encourage me in my faith. My grandpa never went to Hollywood. He’s not a CEO of a big corporation or a high-position politician. He’s a regular guy in a small town who simply says yes when God asks to use him. It turns out that doing so is not only a blessing to those around him; it’s also probably one of the reasons he’s lived so long. Research has shown that those who have strong relationships and serve others tend to live healthier, more joyful lives. When we go through stress, it’s easy to hunker down and withdraw from others. I certainly tend to respond that way. If I’m having a hard day, I’m more likely to sit on the corner of the couch with some chocolate for a private pity party than to reach out to those around me. I’m slowly learning that choice isn’t beneficial. We are made to connect with others. Daniel Goleman, author of Social Intelligence, says, “Our brain has been preset for kindness.”[i] He goes on to share that we are always impacted by those around us. Through brain “loops” we catch each other’s moods like colds. Watch two friends having an intimate conversation. Their body language almost always synchronizes without them even realizing it. What this ultimately means is that when we bring joy to others, it comes back to us in both spiritual and physical ways. When we’re stressed, we need to shift our internal state, and serving others can be one of the most effective ways to do so. Have you ever felt this way? I have. But it’s simply not true. Throughout Scripture God uses messy, broken people right in the middle of their greatest challenges. We don’t need to have it all together. Wherever we are today, we can serve in some way. Even if it’s just offering a smile to the nurse in our hospital room. Or making our toddler giggle when we’re almost at the end of our patience. Or listening to a friend at church on Sunday morning when we’d really like to get home to our house and the couch instead. What I’ve seen through my grandpa’s life is that true service isn’t about grand gestures; it’s about a series of small choices. Most of them unseen. Many we won’t know the impact of this side of heaven. All of which add up to a lifetime of resilience and loving well.